Gray T-shirt, front. Photo by Chuck Hawks. The Guns and Shooting Online T-shirt is a top quality, double layer (micro-polyester outer, cotton inner), Haines T-shirts. They are printed in Eugene, Oregon, U.S.A. These deluxe high-neck shirts feature "GUNS AND SHOOTING ONLINE" in patriotic red and blue lettering over a graphic of a lever action rifle on the back. A small "GS" logo, in a style that you might find on the trigger guard of a fine double gun, decorates the front. These are really good looking T-shirts that you can wear with pride. White T-shirt, back. Photo by Chuck Hawks. A high tech dye sublimation transfer process applies the graphics. This is superior to and far more durable than screen-printing. Any color dye can fade, but these T-shirts really do last. I have been wearing them frequently since their introduction and my oldest shirts, both white and gray, still look great. I wash my personal Guns and Shooting Online T-shirts with all of my other clothes; they receive no special handling. I leave my Whirlpool automatic washing machine set for the normal warm/cold wash cycle (after all, I am a bachelor), and they have held up just fine. 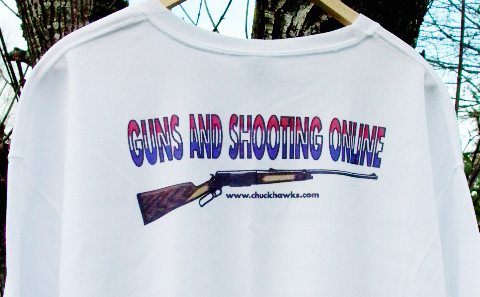 Guns and Shooting Online T-shirts are available in white or ash gray. Sizes are small, medium, large, and extra large..